Be the first to share your favorite memory, photo or story of Delores . This memorial page is dedicated for family, friends and future generations to celebrate the life of their loved one. 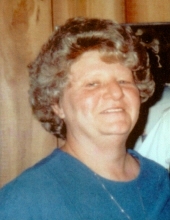 Delores Ball, age 70, of Richlands, VA passed away Friday, March 29, 2019 at her home. She was born October 25, 1948 in Jewell Ridge, VA. She was a graduate of Richlands High School. She was a devoted wife, mother, and grandmother. Delores was preceded in death by her parents, Cecil Lee Childress and Elsie Horn Childress; her husband, Jimmy Wayne Ball; one sister, Barbara Boyd. She is survived by one daughter, Becky Ball and Joe Russell of Bristol, VA: one son, Cecil Ball and mother of his children, Dawn of Richlands; grandchildren, Nickoal Powell, Adriannah Ball, Jaycob Powell, Hayleigh Ball, Harlee Ball and Gabrayl Powell; one soon to be great-grandchild; two sisters, Ann Keen and husband Tommy of Richlands, VA and Charlotte Boyd and husband Jesse of Cedar Bluff, VA; several nieces and nephews also survive. The family will receive friends from 6 – 9 p.m. Sunday, March 31, 2019 at Singleton Funeral Service in Cedar Bluff, VA.
Funeral Services will be conducted at 1 p.m. Monday, April 1 at the Singleton Funeral Service Chapel with Pastor Allen Gross officiating. Burial will follow in Greenhills Memory Gardens at Claypool Hill, VA. Family and friends will serve as pallbearers. The family of Delores Ball is in the care of Singleton Funeral Service in Cedar Bluff, VA.
To send flowers or a remembrance gift to the family of Delores Childress Ball, please visit our Tribute Store. "Email Address" would like to share the life celebration of Delores Childress Ball. Click on the "link" to go to share a favorite memory or leave a condolence message for the family.